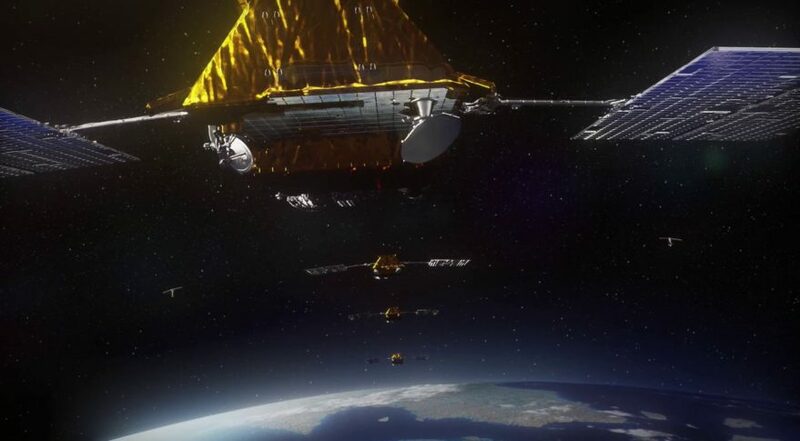 COLORADO SPRINGS — Franco-Italian satellite manufacturer and space hardware provider Thales Alenia Space says it wants to get into the satellite servicing market, provided it can secure a government customer to kickstart the business. Roberto Provera, Thales Alenia Space’s director of human spaceflight and transportation programs, said the company envisions having a servicing business by 2024 or 2025, and is currently in concept development. The company’s servicer would have a strong focus on debris removal, he said. Provera said Thales Alenia Space’s involvement in satellite servicing is predicated on having a government customer — likely the European Space Agency — at the start. The European Space Agency is leading a program called e.deorbit that would capture a satellite and remove it from orbit, either by burning it up in Earth’s atmosphere or sending it far away from popular orbits. Last year ESA revised e.deorbit after the initially proposed demonstration mission — deorbiting Envisat, an ESA Earth-observation satellite that shut down unexpectedly in 2012 — was viewed as too risky by industry. The updated e.deorbit program doesn’t specify which satellite a company must deorbit, and includes a broader range of services, such as in-orbit refueling or repair. Provera said Thales Alenia Space is following this program as a means of getting into satellite servicing. Two companies, Northrop Grumman Innovation Systems and Effective Space, are preparing to launch satellite servicers, but for commercial customers. Northrop Grumman Innovation Systems is launching MEV-1, its first Mission Extension Vehicle, this year on an International Launch Services Proton. Effective Space in 2018 secured a Proton rideshare for the launch of two Space Drone satellite life-extension vehicles in 2020. Thales Alenia Space’s entrance into satellite servicing could fill the void left by Maxar Technologies, which bowed out of the U.S. Defense Advanced Research Projects Agency’s RSGS program in January. RSGS, or the Robotic Servicing of Geosynchronous Satellites, was a public-private partnership that Maxar deemed too expensive amid the company’s financial struggles. Provera said Thales Alenia Space does not intend to bid on RSGS, though DARPA is seeking a new industrial partner for that mission.